1) Incense burning opens the mind to divinity. 2) Incense burning cleanes th mind. 3) Incense burning divests the mind of worldly impurities. 4) Incense burning wakes up the mind. 5) Incense burning encourages the mind in solitude. 6) Incense burning affords the mind lesure when it is busy. 7) One cannot burn too much incense. 8) Yet, even a little incense is enough. 9) Age does not affect the efficacy of incense. 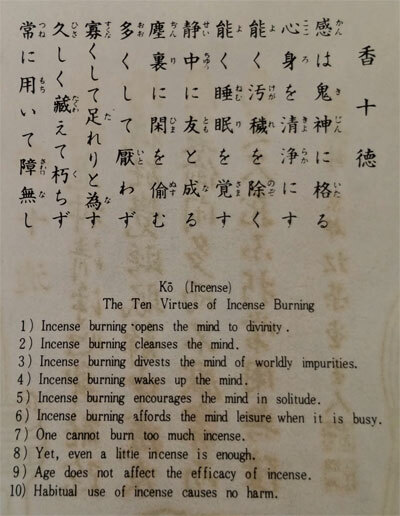 10) Habitual use of incense causes no harm.